I pinned this on Pintrest. BRILLIANT. Also, I'm here to tell you it's working out great. Elegant simplicity. The best kind! I emailed the photo to myself and all my friends! O.M.G!! What a fantastically simple solution! wow - duh! :) such a great idea. That's an amazing tip. Try "Babelfish.com" for translation in the future. I actually just translated this but it is so simple it's not even worth pasting here. Thanks for the tip! OMG! So brilliant, thanks for sharing! How often do you that you have a (USB) cable disappears behind the desk? And you need at the knees to the cable back above table, no office work is no fun. A very easy and inexpensive solution is a pair of binder clips (to be known as banker's clips or foldback clips called). Squeeze the legs together to keep an eye on the eye from the clip so that you can easily get to the cable going to do. Make eye back onto the binder clip. Clip the binder clip to the edge of your desk (eg behind your monitor) and go! 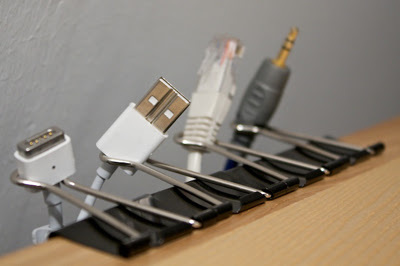 Binder clips are also great if your office desk has holes in the surface so you can thread through cords. The holes in my desk were too big and I had to keep searching for my iphone charger on the phone until I threaded it through and slapped a binder clip on it. Now it doesn't slip through to the floor anymore. Wow. It's always the simply genius things that amaze me. Figuring out Relativity? Psshh, don't care. Figuring out to keep cords up with binder clips. Amazing. Wow, what a good idea...off to find binder clips. Couldn't say it any better than the last commenter -- Genius! Yep - Genius is what it is! Simple & effective. Soooooooooo cool! What a fantastic idea!! Ughhh DUH! Can't believe I didn't think of this. i love this idea!!! i really need to get them out of my way! Push them back a bit and you can thread cables through the black part and the desk. These things are a god send for cable haters like myself. There is all kinds of different sizes and I keep a bunch of each handy for cable ties also. THIS IS A TERRIBLE IDEA! Has anyone actually tried this? IT DOESN"T WORK! The cables keep falling through and if you need to move the cable it's a pain. It is NOT brilliant! I put this into practice immediately! Both our chargers will fit through 1 clip; in fact, my charger is a little skinny, so it needs to share or it can still fall through. Great idea!! Thank you for sharing!! Sometimes the easiest ideas are the best!! Now why didn't I think of that before?!! that's a great idea!! What wonderful idea to prevent the unnecessary damage for usb cord.